Behind every great printer, there's a great designer. Someone who knows how to produce creative and accurate designs on screen ready to put onto paper. That's exactly what sets Esquire Print apart from other printing companies; our design services. Because we do the design as well as the print we understand not only the customer's demands but also the requirements of the production process. for and make every effort to provide inspiring, unique and practical designs. We truly are passionate about design. 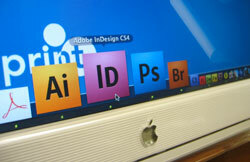 Our experienced staff use the latest Apple and PC software to create and handle your files. We also have a large collection of fonts, vector images and photo libraries to complement your designs. stationery to make your image fresh and exciting!"